Lucy and the Mertzes accompany Ricky on a band tour to Tokyo, Japan, where they encounter Bob Cummings in the adjoining hotel suite. After Ricky refuses to spring for a string of real pearls for Lucy (she's tired of her tacky artificial ones), she's overjoyed when Cummings offers to get them from a friend at a substantial discount. Lucy must solve one problem first - she must come up with the money to pay for them. Lucy and Ethel hit on a scheme to "borrow" the cash from Fred's never-opened money belt - then panic when Fred decides that the belt has grown too tight and announces he plans to buy a new one. Lucy reluctantly asks Cummings to return the necklace, but unwittingly gives him her original cheap strand instead of the real pearls. Hoping to catch up to Cummings before he makes the transaction, Lucy and Ethel follow him to a mens-only Geisha house. Not stopped by convention, the girls disguise themselves in full Geisha attire, slip into the club, and discover Ricky and Fred, who were supposed to be at a ball game, there, too. All is forgiven when the boys decide to buy their wifes each a strand of real pearls. 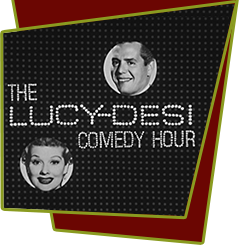 Special Notes: Although not visible due to the show being filmed in black and white, Lucille Ball shot many scenes with red eyes due to constant fighting and subsequent crying over marital tensions with Desi Arnaz. It is also the very last time we will see the Ricardos and Mertzes during the 1950s. This was the second episode that Desi Arnaz is credited as director. Despite its international location, the episode was completely shot at Desilu Studios in Hollywood. There was no studio audience present for the filming. There are stock footage insert shots of the aircraft and the hotel.